Are you planning to create your own Wedding Stationery? Then maybe I can help. 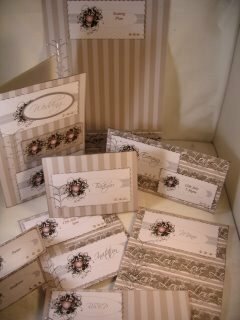 There is a lot of planning to do for what will be your "Big Day" and your stationery is one of the most important areas. You will want to get this just right to suit the theme of your wedding and you will need to give yourself plenty of time to get it all done. Some of the things that need to be considered are the colour scheme and the actual theme. Is it to be a traditional occasion or will it have more of a modern feel. At what time of year is it to take place as color can make all the difference to your designs. And what type of ceremony will it be as there are many different types of service. The venue where the wedding is to be conducted also needs to be taken into account, as these days not all wedding are performed in a church or registry office. How many people will be attending the wedding ... and a thing worth remembering ... is to keep it simple, especially if you have hundreds to send your invitations to. But you could also be making all these itmes for someone elses wedding ... as part of your business. In that case you need to be really sure of what you are doing. Gather all your facts before you start. Have a portfolio of the kind of work you are prepared to do. Have many meetings with the couple on a regular basis to make sure that you are still on track ... and they haven't changed their minds about something ... and not told you. Make doubly sure that you spell their names correctly and that the date is also the correct one. I cannot stress to you enough all the things you need to get just right for such a special day. 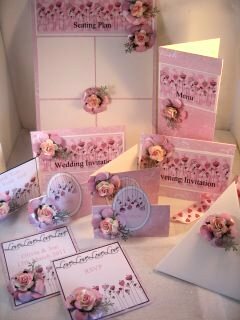 If you get it wrong for someone else and it is your Wedding Stationery business then you won't get many customners in the future. An important thing to do is to write down exactly what it is they want and get them to sign it ... a sort of contract ... so that should anything be not as they expected at least you have the contract to show them what they ordered. And I cannot stress this enough ... GET a DEPOSIT to cover you for the work you are about to undertake.